want to ask about the possibility of sharing the course I uploaded on my account with others. I mean if it is possible to get a link or to make anything in order to have anonymous access to my course. Because I want to share my course with people, but it is difficult to add too many in the system. and i don't want user to login in order to access the course, i want him to access it directly. b. To share the course or other content with the users and allow direct access, you may use the direct link placeholder in the enrollment notification. Basically the enroll of the user is still necessary and the access of the user is done via the direct access link, we call autologin. When creating of editing the notification, there is the placeholder field or button. The list contains various system values that may be added to the email message and therefore the message is personalized to each user. Find the autologin placeholder, copy and paste the string starting ## and ending with ## to your message. Edit your notification text, save and you are done. Consider using of placeholder as all of the users receive this autologin link when you enrolling those to the course or other content. 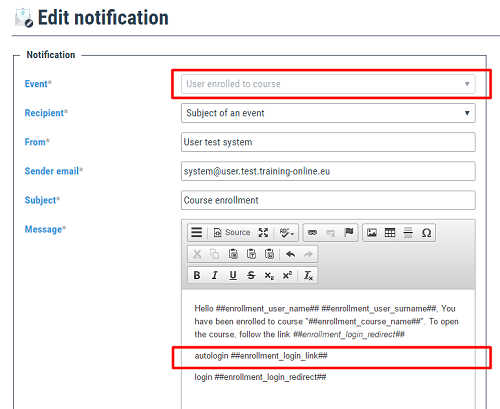 The Training-Online.eu login reasons (using the name and password) is to be able prove who was performing the study. In case of autologin link, everyone may login and study in case he has the link available.